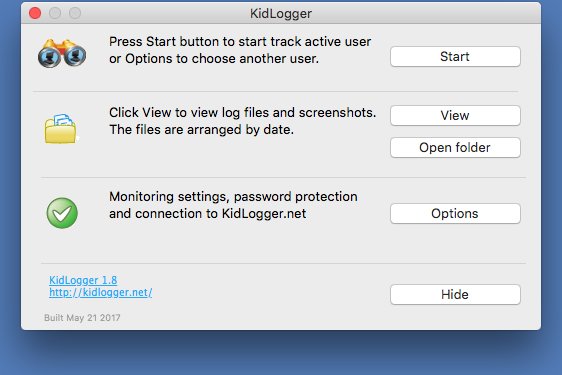 How to install and configure Kidlogger for MAC? tab Kidlogger.net. Choose Upload to server, In the device ID insert e-mail address, you used for your registration. If you want to connect your computer to existing virtual device of your account, insert its device id, into this field. On tab users select user profiles to monitor. 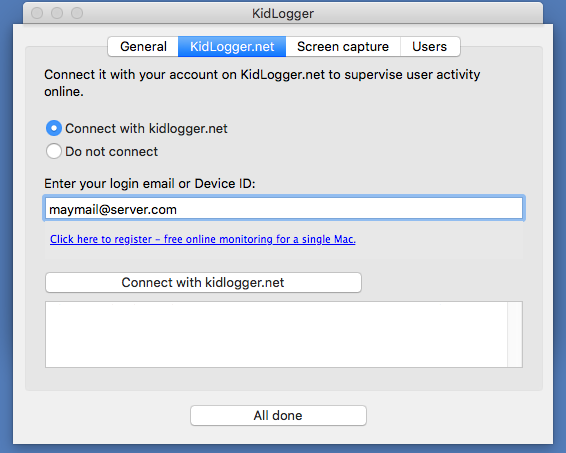 Note: If you select all user accounts, Kidlogger Agent will uppload all the information into one virtual device on the server. On tabs general and screen capture you can precise, what do you want to record: screenshots, text, or both. Press Start button in main window of the application. Open System Preferences, Security and privacy, Privacy, Accessibility. 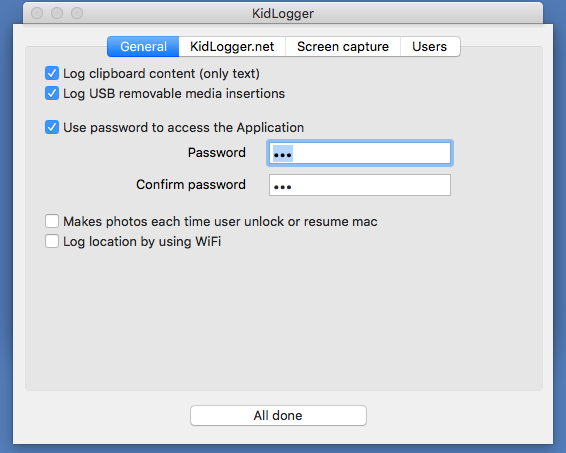 Unlock the settings and check KidLogger application on. Now restart please your MAC. Uninstall Kidlogger application. Download it please again from the server. 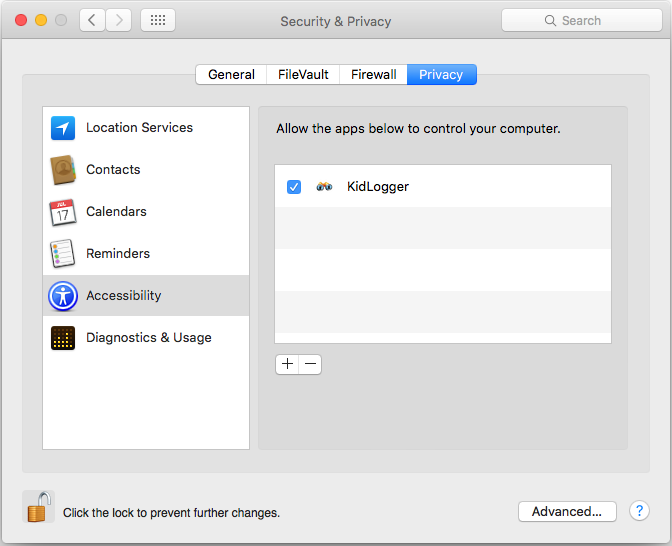 Move the Kidlogger.app folder somewhere in a folder with common access. Do not forget where. Launch it from there by double clicking. Configure all the features and click Start button. Although, a user can find it in Activity monitor. 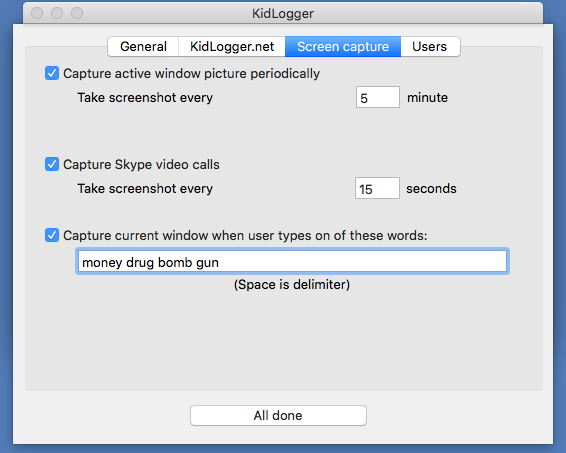 Install Kidlogger PRO application for MAC instead of simple Kidlogger. This PRO application is accessible for Standard and PRO users on Downloads page. How to view the log file on local computer. Launch Kidlogger application, click on View button. A current journal file will be opened in Web-browser. If you know how to view the source code, you will be able to view when and how long was used any application. Click Open folder link. A folder with log files and screenshots will appear. Pay attention on name of screenshot: it shows the date and time when it was taken. 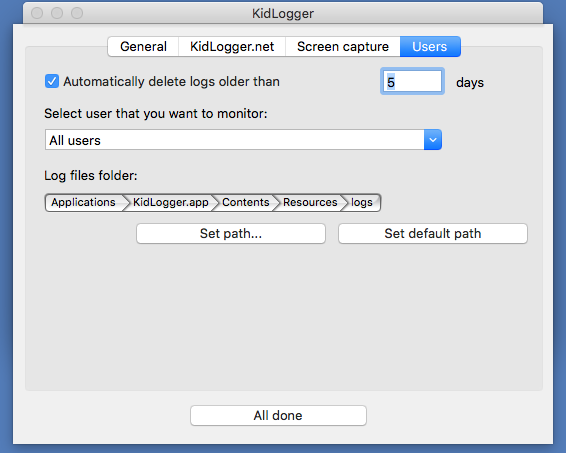 How to delete KidLogger application from Mac? Launch Finder applicaiton, perform a right-click on KidLogger icon and choose "Move to trash"